Brambles (Rubus fruticosus), considered as an unwanted woody weed and usually only seen as useful for their fruit, have in the past been used for basketmaking. 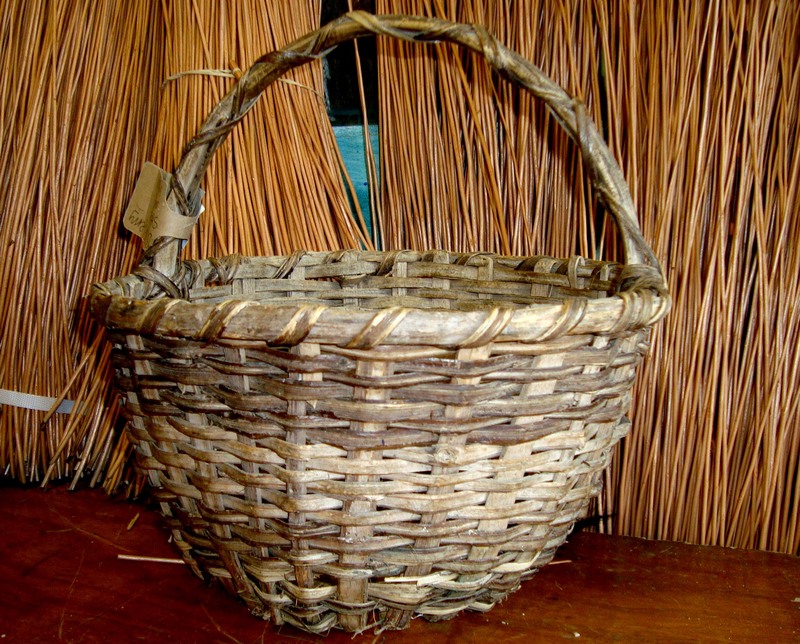 Split and shaved bramble stems were used as stitching material when making bee skeps from coiled straw and there are examples in Cornwall of baskets using bramble for the side weaving on baskets made from split and shaved willow made by travellers. 30 year old basket made by Tom Aldridge in his 70’s. the basket has split willow ribs and bramble woven into the sides. Tom lived on Rosudgeon Common in Cornwall and came from a travelling family. Harvest bramble material when the sap is down and the plant is dormant, between November and February. 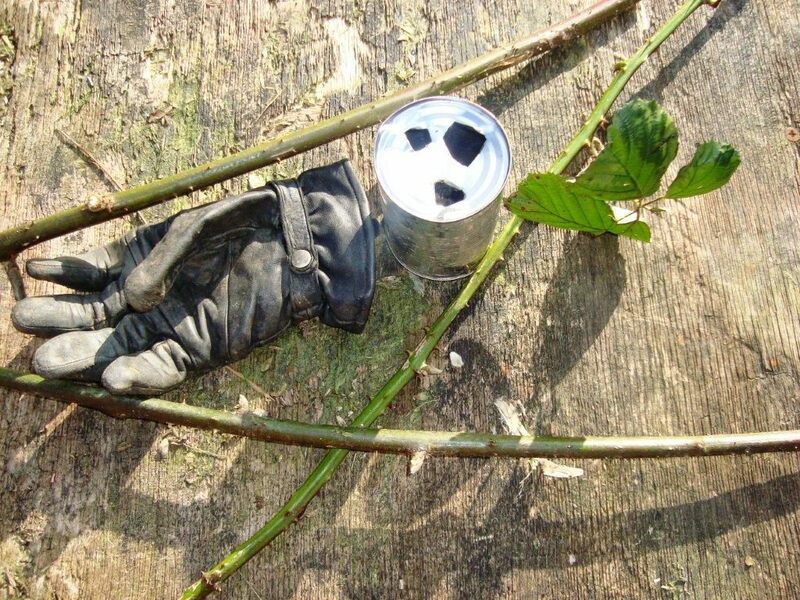 You will need thick gloves and a pair of sharp secateurs. Not all bramble is suitable and you are looking for one year’s growth, long straight growing stems that come up through the undergrowth or grow into trees and are over 2m long. Particularly useful are those that don’t have side shoots. Use leather gloves, fingerless ones are good. 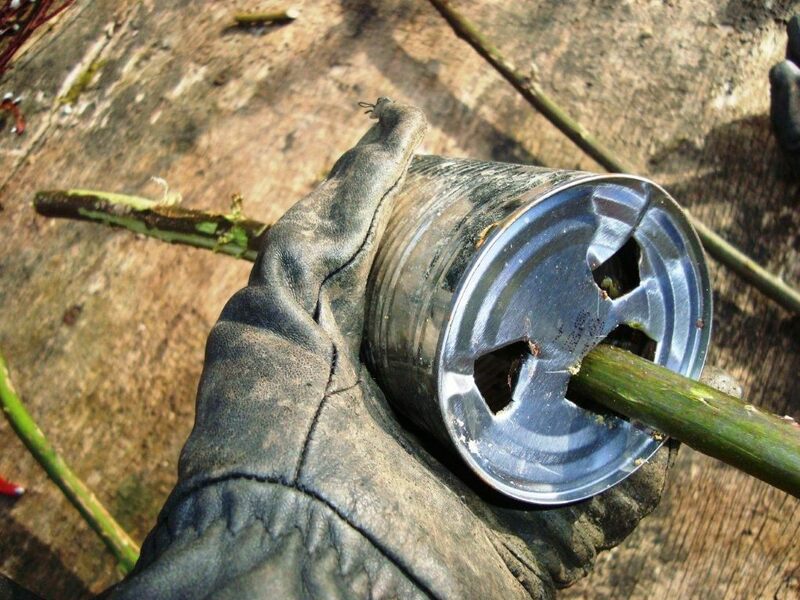 First remove the thorns either by pulling the stems backwards and forwards through a hole punched in a tin can or by pulling them through a piece of rough leather. 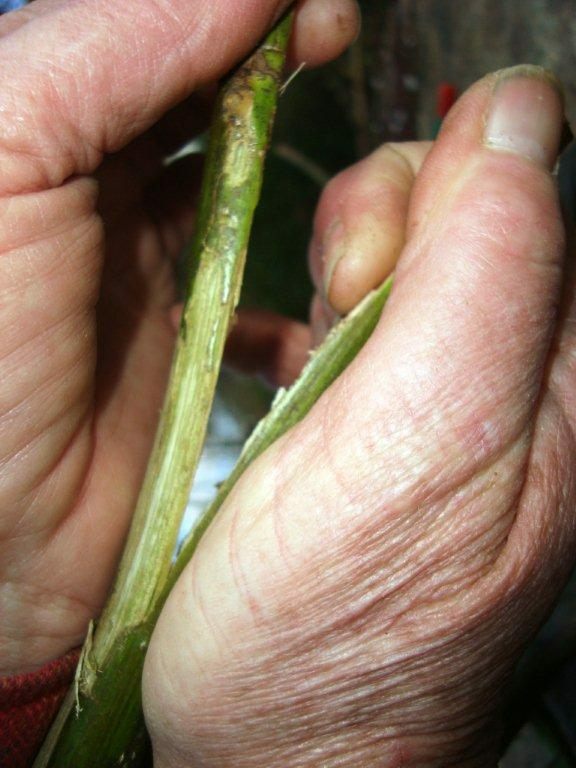 The stems need to be split within two to three days of harvesting when they are still green. First remove any side shoots and leaves. Use a knife to make an incision in one end of the stem and then split it into two using your fingers. The split runs ahead and it is pressure that makes it split. The principle of splitting is to pull harder on whichever side is weakest in order to bring the split back into the centre, this needs practice. Once you have two pieces these need to be split again so that you obtain four lengths from each stem. You can also split the stem into three or four from the start using a 3-way or 4-way cleaveing tool. Once the stems are split the pith needs to be shaved. as the pith makes the material difficult to bend. Scrape off the pith until you have long thin strips of wood. The backs of the stems are scraped smooth. You will need a sharp knife with a straight blade and a piece of leather to protect your clothes. This is easier to do sitting on a low stool. Place the leather just above your knee and then with the knife blade held still pull the stem with pith side up through the blade towards yourself. Once the stems are shaved they may be used straight away or can be dried and stored in an airy place for future. They can be coiled up or tied in a long bundle tied with string and maybe hang up threaded on a string. If the stems have been dried soak them in fresh water overnight to make them pliable. They are good for weaving the sides of a basket.